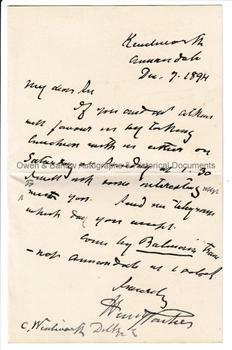 SIR HENRY PARKES Autograph Letter Signed. Australian colonial politician and longest serving Prime Minister of the State of New South Wales. Known as the 'Father of Federation' for his leading role in the unification of the six Australian colonies. ALS 1p bifolium with one integral blank leaf, together with original envelope. 18 x 11.5 cms (7 x 4.5 inches). Kenilworth, Annandale. December 7th 1894. To C[harles] Wentworth Dilke. "My Dear Sir, If you and Mr Atkins will favour us by taking luncheon with us either on Saturday or Sunday at 1.30 I will ask some interesting men to meet you. Send me telegram which day you accept. Come by Balmain train (?) - not Annandale at (...?). Sincerely, Henry Parkes. 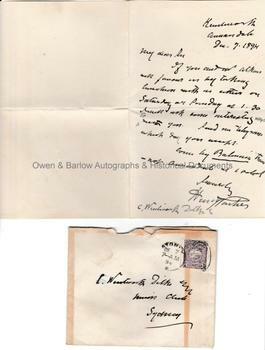 Letter in fine condition. Envelope has some browning and offsetting with mounting traces to verso. Charles Wentworth Dilke (3rd Baronet) was the son of Sir Charles Dilke who had been Gladstone's secretary of state for foreign affairs and had been tipped as a future prime minister before his career was ruined by the Crawford divorce scandal. His son, Charles Wentworth Dilke, suffered from an acute persecution complex and bouts of insanity. He spent periods of time in Australia, where the family had considerable investments and holdings and a few years before his death he married Pearl Faithfull, the daughter of a Sydney solicitor.